Lindsay Mason: Some new stamps! Me again. I have some new stamp designs to share with you! They will be available from the second week in September and you can find images and details of all the new Personal Impressions stamp releases on the website - link is on my left sidebar. If you go to "Coming Soon" and choose Art Stamps it will show you the full range, or you can choose my name to see my specific designs. As I said, with David's illness, I wasn't able to get all my Christmas designs finished this time, but I had already got some ready including these I'm posting today, some "Tinchies" and some new verse and sentiment sets. Hope you like them! 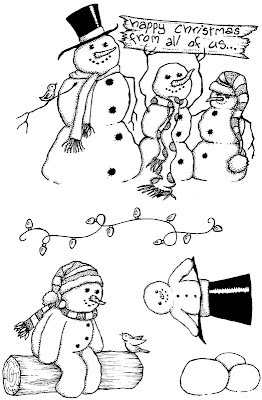 The first one is an A5 set called "DIY Snowman" (PICSA5344). 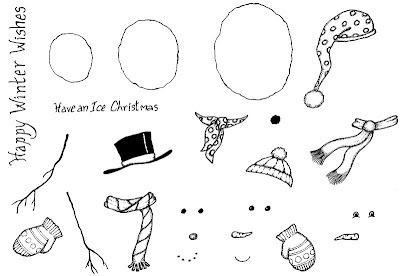 As you can see, it has everything you need to create lots of different snowman images...he can be two or three snowballs high, with a choice of hats, scarfs and mittens as well as various facial features. The eyes, noses etc are all separate, so you can position them just how you want.I can't wait to get started on this set as I love snowmen! 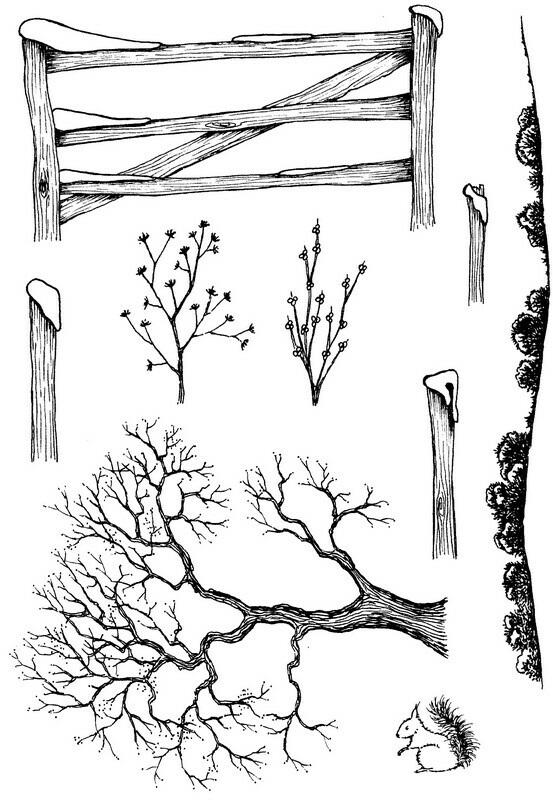 Next is an A6 set called "Winter Country Scene" (PICSA6369) which is a good one for Christmas cards, winter birthdays and, of course, the tree, squirrel, tree line and plants can be used all year - even the gate can be if you cut it out and chop off the snow. I'm going to enjoy using this set I know! Finally for now, another A6 set, again featuring jolly snowmen. This one is called "Christmas from all of us" (PICSA66362) and features three different snowmen images as well as Christmas lights and snowballs. This set's a lot of fun - I love the fact that you can feature as many snowmen as you want to on a card and that you can mix the styles too. I'll post some more pics soon. They'll be available from any store selling PI products and if anyone wants to get them, just make a note of the titles and codes and ask the retailer to order them for you. Well, after last night's dramatic thunder, lightning and bouncing rain, it's now scorchingly hot. After finishing some more samples I was going to get that little wall completed whilst the weather's dry. However, my plans have been scuppered due to the local shop having sold out of mortar - how cheeky! So, it will have to wait till Monday now. I do have some other little jobs that I can attend to though and am desperate to get the bark chips down as soon as I can so the weeds don't get a hold again after all my digging and hoeing. My brother in law donated some Semperviviums and some seeds taken from their garden today, so I have a little planting to do tonight and will add the seeds to my growing collection in the garage waiting to be sown at the correct time. I've been hampered too by my hand today. 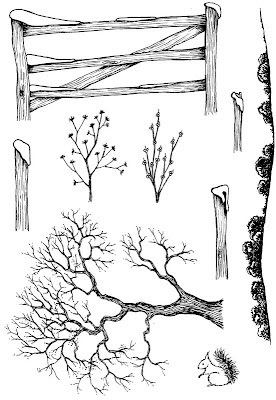 Yesterday morning I had to prune back some very tall branches from the bushes in my neighbour's garden that were blocking some of the light coming into my work area. She's been in hospital for a few weeks, so things have got a bit out of control. I was merrily cutting away when I got zapped by a Nettle that I'd not seen. Didn't hurt much but within an hour or so it felt like I had ants crawling under my skin and has just got worse. The incessant itch kept me awake half the night and I've made it worse by scratching - even though I did try not to! I now have a very red and swollen right hand (great when you're right handed!) so have seen the chemist and got some cream and tablets that I'm hoping will do the trick - and soon, before I go round the bend! At least I know to wear my gloves next time I tackle next door's overhanging garden! Thank you for the comments about the foot drawing! If time, and my dodgy hand allow, I may well draw something else to show you tonight. Meanwhile, I'm off to rub some more cream on and get a cold drink. big hugs Joanne & 'T'. 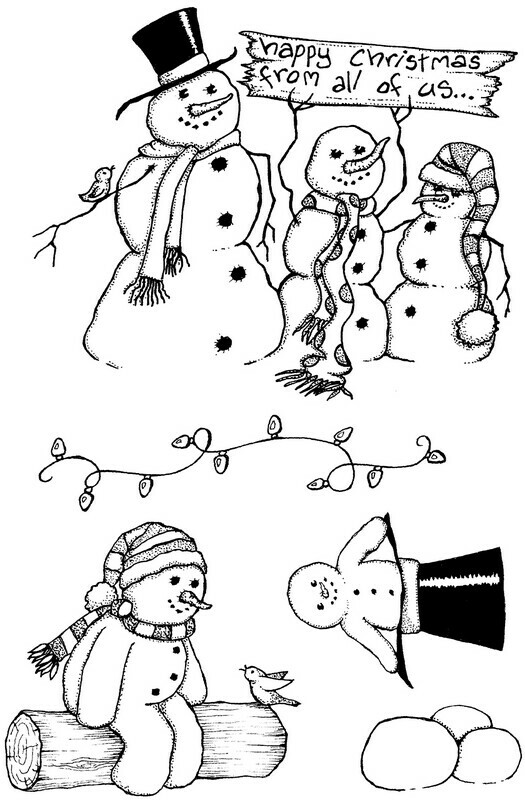 Oh I am loving the Snowmen,how cute are they.